You didn’t think a little heat could faze those resourceful Japanese did you? Well, okay, a lot of heat. While most of us westerners over here are sweating up a storm even with air conditioning, many Japanese citizens have had to bear the heat while forgoing AC in order to save electricity due to power shortages caused by the Fukushima nuclear plant disasters. 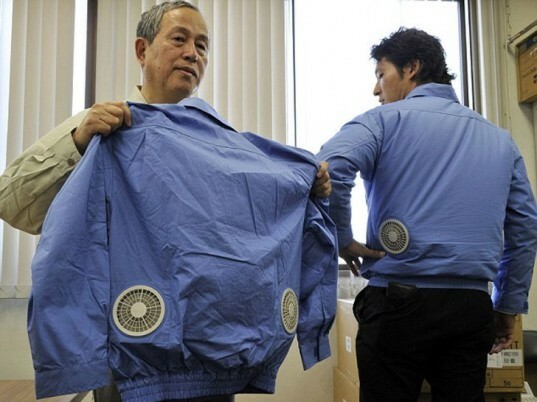 Rather than become slaves to the weather, a few Japanese designers have come up with clothing that has air conditioners built right in! Do you think these chilled garments are crazy or are you craving some of your own? You didn't think a little heat could faze those resourceful Japanese did you? Well, okay, a lot of heat. While most of us westerners over here are sweating up a storm even with air conditioning, many Japanese citizens have had to bear the heat while forgoing AC in order to save electricity due to power shortages caused by the Fukushima nuclear plant disasters. Rather than become slaves to the weather, a few Japanese designers have come up with clothing that has air conditioners built right in! Do you think these chilled garments are crazy or are you craving some of your own?